For the Greek minuscule manuscript of the New Testament also known as Codex Leicester, see Minuscule 69. The Codex Leicester (also briefly known as Codex Hammer) is a collection of scientific writings by Leonardo da Vinci. The Codex is named after Thomas Coke, later created Earl of Leicester, who purchased it in 1719. The manuscript currently holds the record for the second highest sale price of any book, as it was sold to Bill Gates at Christie's auction house on 11 November 1994 in New York for US$30,802,500 (equivalent to $52,068,300 in 2018). The Codex provides an insight into the inquiring mind of the definitive Renaissance artist, scientist and thinker as well as an exceptional illustration of the link between art and science and the creativity of the scientific process. An explanation of why fossils can be found on mountains. Hundreds of years before plate tectonics became accepted scientific theory, Leonardo believed that mountains had previously formed sea beds, which were gradually lifted until they formed mountains. The movement of water. This is the main topic of the Leicester Codex. Among other things, Leonardo wrote about the flow of water in rivers, and how it is affected by different obstacles put in its way. From his observations he made recommendations about bridge construction and erosion. The luminosity of the Moon. Leonardo speculated that the Moon's surface is covered by water, which reflects light from the Sun. In this model, waves on the water's surface cause the light to be reflected in many directions, explaining why the Moon is not as bright as the Sun. Leonardo explained that the pale glow on the dark portion of the crescent Moon is caused by sunlight reflected from the Earth. Thus, he described the phenomenon of planetshine one hundred years before the German astronomer Johannes Kepler proved it. The Codex consists of 18 sheets of paper, each folded in half and written on both sides, forming the complete 72-page document. At one time the sheets were bound together, but they are now displayed separately. It was handwritten in Italian by Leonardo, using his characteristic mirror writing, and supported by copious drawings and diagrams. The Codex was purchased at auction from the Leicester estate in 1980, by wealthy industrialist and art collector Armand Hammer, for $5.1 million ($15.5 million in 2018 dollars), later renaming the notebook Codex Hammer. Hammer commissioned Leonardo da Vinci scholar, Dr. Carlo Pedretti, to compile the loose pages of the codex back into its original form. Over the next seven years Dr. Pedretti translated each page to English, completing the project in 1987. The Codex was sold to Bill Gates by Christie's auction house on 11 November 1994 in New York for US$30,802,500. After Gates acquired the Codex, he had its pages scanned into digital image files, some of which were later distributed as screen saver and wallpaper files on a CD-ROM as part of a Microsoft Plus! for Windows 95 desktop theme, which would later be included with Windows 98 and Windows ME. A comprehensive CD-ROM version (simply titled Leonardo da Vinci) was released by Corbis in 1997. The Codex Leicester has been unbound with each page individually mounted between glass panes. It is put on public display once a year in a different city around the world. In 2000, it was displayed at Sydney's Powerhouse Museum. In 2004, it was exhibited in the Château de Chambord, and in 2005 in Tokyo. One page was exhibited at the Seattle Museum of Flight's 2006 exhibit "Leonardo da Vinci: Man, Inventor, Genius". From June to August 2007, the Codex was the centerpiece of a two-month exhibition hosted by the Chester Beatty Library in Dublin, Ireland. The Codex was on view at the Phoenix Art Museum in Phoenix, Arizona from 24 January 2015 through 12 April 2015 for the exhibition Leonardo Da Vinci's Codex Leicester and the Power of Observation. Its presentation at Phoenix Art Museum was the first time a work by the hand of Leonardo himself was on view in Arizona. The Codex was then on view at the Minneapolis Institute of Arts in an exhibition Leonardo Da Vinci, the Codex Leicester, and the Creative Mind that opened 21 June 2015, where it remained on display until 30 August 2015. As part of the same tour, the Codex Leicester was also on display at the North Carolina Museum of Art in Raleigh, North Carolina from 31 October 2015 to 17 January 2016. ^ "BBC News: Bay Psalm Book is most expensive printed work at $14.2m". BBC News. 27 November 2013. Retrieved 30 November 2013. ^ a b "Christie, Manson and Woods, sale 8030, 11 November 1994". Christies.com. 1994-11-11. Retrieved 2013-07-23. ^ Kuruvilla, Carol (2017-09-22). "Mormon Church Drops $35 Million On Printer's Manuscript Of The Book Of Mormon". Huffington Post. Retrieved 2017-09-25. ^ a b c d "An introduction to Leonardo da Vinci's Codices Arundel and Leicester" (PDF). ^ "The Most Expensive Antique Items Ever Sold: Part I". 8 July 2018. ^ "The Sunday Tribune – Spectrum". www.tribuneindia.com. ^ Christopher Reynolds and Hugh Hart (15 January 2007). "The Da Vinci codex versus the museum code". LA Times. Retrieved 27 March 2013. ^ Pedretti, catalogue by Jane Roberts ; introduction by Carlo (1981). Leonardo da Vinci : the Codex Hammer : formerly the Codex Leicester. Los Angeles: Armand Hammer Foundation. ISBN 0384205909. 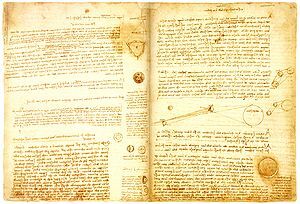 ^ "The World Today Archive – Leonardo da Vinci manuscript on display". Abc.net.au. Retrieved 2013-07-23. ^ "Phoenix Art Museum – Exhibition Exhibitions". ^ "Leonardo da Vinci, the Codex Leicester, and the Creative Mind — Minneapolis Institute of Art – Minneapolis Institute of Art". Minneapolis Institute of Art. ^ "Leonardo da Vinci's Codex Leicester and the Creative Mind – Exhibitions – NCMA – North Carolina Museum of Art". Thereza Wells, ed. (2008). Notebooks of Leonardo da VInci, selected by Irma A. Richter. Oxford World's Classics (new ed.). Oxford: Oxford University Press. ISBN 978-0-19-929902-7. Christie's Auction House (1980). The Codex Leicester by Leonardo Da Vinci. Christie's. . Sale catalogue, held on Friday 12 December 1980. Wikimedia Commons has media related to Codex Hammer.